When QOR Admin render pages, it looks up templates with AssetFS. A default implemention of AssetFS is looking up templates from the filesystem with pre-registered view paths. QOR Admin provides flexible template customization. You can define your own theme for a resource. Then, you can put a new template with the same name to QOR View Paths, QOR Admin will load templates based on priority. QOR Admin provides a flexible way to manage menus. By default, Resource will be listed at the top level of the menu. You can set the position manually. // Register Menu `Sales Report`, The "menu" under "Reports"
// Register Menu `Sales Report` with RelativePath, the finally URL will be admin&apos;s endpoint + RelativePath, `/admin/sales_report` for this example. // Register menu with permission, User has "admin" permission could see the "Report" menu. Please check Authentication for more permission control informations. QOR Admin uses icons from material icons, and pre-generated attribute name on each menu. So it is very easy to customize your own menu icon. 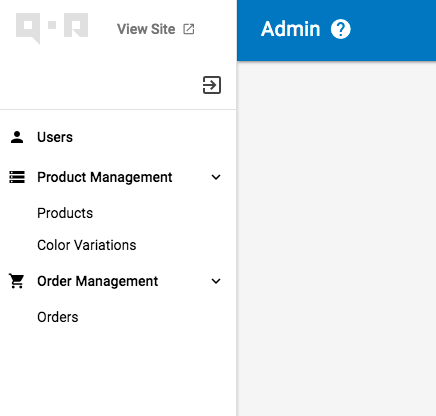 Then put it in the CSS, about how to customize CSS for QOR Admin go check QOR Admin theme. Go to QOR Admin, you should see the icon has been displayed beside the product menu.